Can VR turn me into the zen master? Sometimes it feels like the world is moving faster than ever; you just hop on, hold on, and hope not to fly off the rails. Which is why I find it increasingly important to just stop and take a breath when I can. For some people that's as simple as using the breathing app on an Apple Watch or Fitbit device. Alternatively it can be investing time in meditation and really learning how to centre yourself to find that inner peace. For other people, all they need is a quick workout or a calming walk on the beach. For my VR diary this week, I was looking forward to checking out how the immersive power of VR could help transform me into a zen master. Why go out, or pay someone else, to get calm when I can do it from the space I'm most comfortable in – my own home. Here's the thing: I'm terrible at meditation. It rarely works for me, and that's because my mind is always racing at 150 miles per hour. It's incredibly difficult for me to clear my mind and think about absolutely nothing, because I'm always thinking about the next feature, or what I need to do next, or whether I should see Ready Player One, or what Netflix series I should binge this weekend. It's even worse when I have some kind of guru yapping in my ear about what I need to do. The simpler the better. I'm a big fan of the breathing apps offered by Fitbit and Apple, which simply tell me when to breathe in and when to breathe out. That I can do. With all of that said, I decided to first challenge myself and went with Guided Meditation VR, an app from developer Cubicle Ninjas. It gives you a load of different meditation locations to choose from and then allows you to pick the music and a meditation type. It's also got different audio lessons depending on whether you just need to unwind or whether you need to rebound from a bout of anxiety as well. I've been having a bit of anxiety recently about a whole range of issues, so I decided to try out the anxiety meditation. I chose the beach, Costa del Sol, and put on some calming music. Then I was dropped into the good place, though it felt like the bad place. "Imagine you're a baby throwing a ball," the audio coach's spiel began. My mind recoiled. But it went on, telling me to imagine the joy of being a baby and not having a care in the world. I would have listened more, but my mind started racing and wondering whether this lady had to keep herself from laughing while reading these lines. Plus, the music started drowning out what she was saying. I would have changed the settings, but I honestly was happy for the good music to drown out the silliness. Until I heard my guru start telling me that I should imagine myself as an old person at the end of my life, and how I should look back upon my life and how it was filled with love. Luckily, the overwrought meditation technique didn't last much longer. I could then explore the beach-y island by teleporting around. At first, I could just choose where I wanted to teleport and zap there. I spent some time listening to the ocean waves and enjoying the calming music, but I wanted to feel the sea air. I wanted to be in that environment. Something about feeling that much closer to it made it all the more frustrating. So I decided to zoom out of Guided Meditation VR and try Perfect, another meditation app that's hyper focused on giving you "perfect" virtual getaways to escape to. I once again chose the beach, and I have to say it felt a lot more like a real tropical beach. There were butterflies floating around and I could hear the birds chirping. There were chimps in the jungle having fun as well, plus the ocean waves. It all felt really lovely, until I figured out I couldn't explore. I was a tad disappointed, because when I'm on a beach like that I like to look around and just soak in the atmosphere. I wanted to go find and hang out with those chimps (could a poop-flinging mini-game ease my worries!?) Alas, my dreams were dashed. So I did what anyone else would do: I sat on the ground with my headset on and touch controllers in-hand. That was helpful, but I missed the sea air and lack of interactivity. Yes, I even missed the feeling of sand seeping its way into everything. That's when I realized that meditation isn't the only way to help myself calm down and relax. Meditation is just one tool, so I just needed to think about what other ways I like to relax and unwind and see if I can convert that into VR (which is the whole point of this diary series). What I determined I needed was some light entertainment. Something visually arresting enough to keep me engaged. I turned to Firebird – La Peri, which is essentially a VR version of a ballet. You're on a stage and you're flipping through a book, which tells you this story of a king on a quest for immortality. He has to find four magical flower petals, and he needs to capture them from spirit animals that have a tendency to dance around you. This hooked me right in. I had no clue what to expect, but every ounce of the presentation here floored me. The stage moved and transformed around me as I progressed, and watching each spirit animal circle me before I snatched their flower petal filled me with enough awe to forget everything else. It all took the next step toward the end, where I had to watch the final holder of the flower petal perform a beautiful dance around me. I was transfixed, and I legit got a little sad when it was all over – but it had to be over. Interactivity, it turns out, is a good way to keep me focused. Something engaging enough to focus me, but also not too engaging where I feel like it's work. 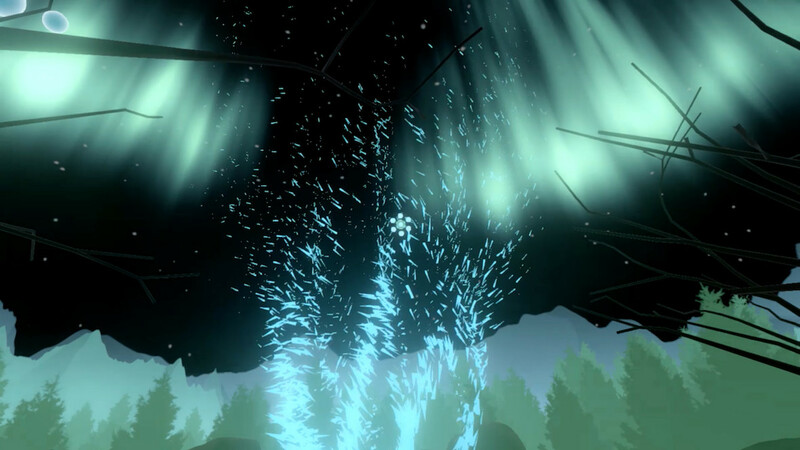 I eventually turned to Lumen, which sends you out into a virtual forest of sorts. You're granted a lumen, which is a fancy way to name a cursor indicative of where you're looking. When you point it at sparkling white things, you can grow a tree. As you trace your eyesight onto the branches, they grow. Once they grow, little orbs appear. If you stare at these, they bloom. It goes on and on. Lumen is brilliant in that it uses your eyesight as a focus tool. You have to look around to breathe life into the world, which keeps you wanting to look around, which keeps you focused, which in turn makes the world beautiful, which then melts away all your worldly troubles. Lumen was so effective at focusing my mind and getting me to relax and chill out that I had to pry myself away from it. My little garden of zen was growing into a beautiful destination and it was all because of how much focus and attention I gave it, while the app gently reminded me to breathe in and out regularly. Throughout this diary series, I've been trying to figure out whether VR could adequately replace real-world scenarios. For meditation and finding focus, it turns out that the real-world replications aren't as good or interesting as the more unique to VR engagements. VR has the ability to help you focus by immersing you in a calming activity. It can even be as simple as letting you focus on a virtual garden. One note on Guided Meditation VR is that there is over 15 hours of meditation content, with 10+ styles of meditation, across 30+ environments. These meditations are each written and narrated by a different teacher, with a different meditation style. So, if you don't prefer a mix you can find a style or place that is the best fit for you. You may find a meditation or environment isn't an ideal fit, which is why we make it simple to swap on the fly. Our mission is to allow you to customize the heck out of your experience because meditation and relaxation are very personal. For example, you may enjoy choosing "No meditation" to listen to the sounds nature or bumping up the spoken audio volume higher. You might also dig the motion option, which is sort of a lazy river where you float through each environment. You have a ton of control, which we've found people prefer as they have wildly varying preferences and needs for comfort. Hope you have a chance to give it a go and find a mix that works best for you!